I need to make a report where given a date range I have to return a row for every day and the prices for every seller. There will be days that some seller don't have a price for a product and there will be days that a seller will have more than one price for a given product. I'm doing it by creating a temp table with the date ranges then join them with the sellers and prices for this but once product_price have a couple thousands rows it get VERY slow (about 4'' to return a 200 rows) and I don't know how to optimize it to get it fast enought. I can't think a workaround for the temp table nor which index should I create. You have only primary keys for tables and indexes related to the FK restrictions but no indexes related to the queries you run. 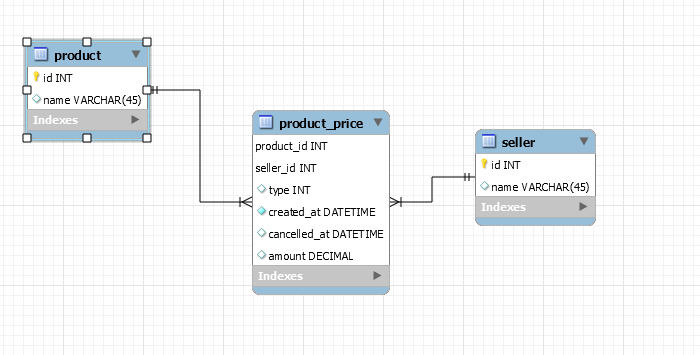 Table product_price should have an additional index (product_id, seller_id, created_at, cancelled_at) - an exact order of the columns depend on the real data. You can try different combinations and choose the fastest one. Can I execute a prepared statement inside a MySQL SELECT? Is it possible to group by a fraction of the result set?